Homemade ricotta cheese is surprisingly easy to make. 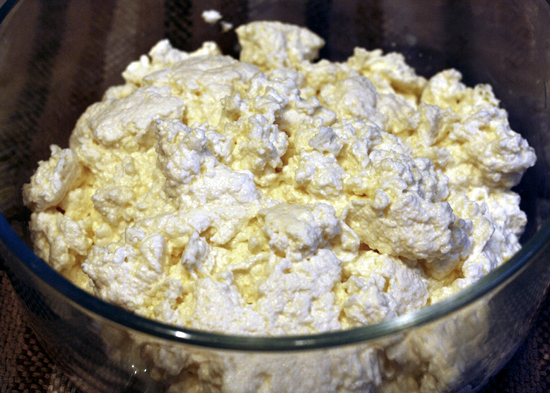 Well, let me rephrase that a bit…making a fresh cheese very similar to ricotta is surprisingly easy. 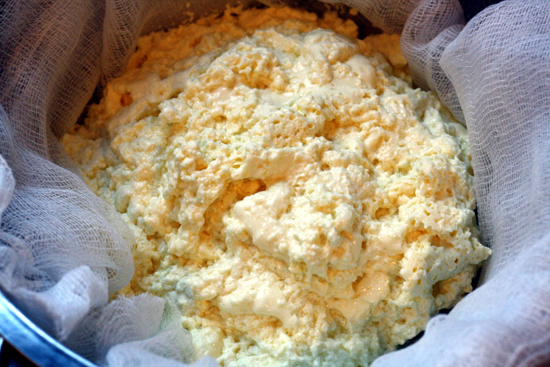 True ricotta cheese is made from the whey obtained from mozzarella production. But you can make a very good ricotta stand-in with just three ingredients: milk, lemon juice or another acid (like white wine vinegar), and salt. Ricotta is not cultured like most other cheeses, so it’s not at all complicated and there isn’t much work involved…do give it a try and you’ll be rewarded with a delicious fresh cheese you can use in both sweet and savory recipes. 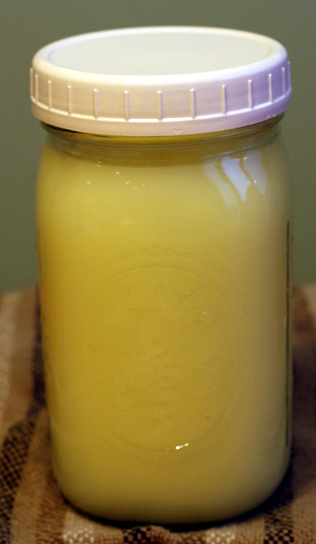 Heat milk and lemon juice or vinegar over very low heat in large heavy pot. Heat to 180°F, the temperature just before boiling. You will see tiny bubbles around the edge of the pan and you’ll notice curds beginning to form. Turn off the heat and cover the pan. Adjust your oven racks to make room for the pot and then heat your oven to 200°F for a few minutes. Turn the oven off, place the covered pot inside, and leave undisturbed for 5-6 hours. Line a colander with 4 layers of cheesecloth and set it over a bowl. Using a finely slotted spoon or skimmer, scoop curds from pan and transfer to cheesecloth-lined colander. Season with 1/2 tsp. of the salt. Mix and taste the cheese. Add the other 1/2 tsp. salt, if necessary. You can let this drain for just a few minutes for a very soft cheese, or allow it to drain for several hours or overnight for a much firmer, dry cheese. 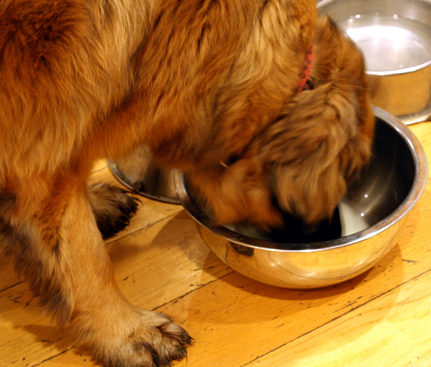 …or if you have animals, they love to drink it. …or with maple syrup and berries (a nice simple breakfast, snack, or dessert). You could also sprinkle it with a little raw cocoa powder and/or ground cinnamon. You can use your homemade ricotta in recipes for cheesecakes, pumpkin ice cream, or other homemade sweets; it’s also great mixed with scrambled eggs, and of course with homemade pasta recipes. It will stay fresh for 5-7 days. I might just have to try this! It looks very good. Yummy! 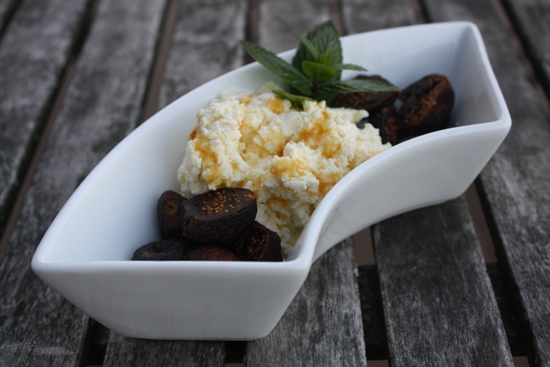 I love ricotta, but never thought of making it myself =D. Thanks for the recipe. Did you mean heat milk, lemon juice AND vinegar (you have it in the alternative). Also, instead of white vinegar, can I use apple cider vinegar?